mPower-Pro is one of many Ubiquiti products, which is designed as an accessory to units mPort and mPort-s mFi. It is an adjustable six socket power adapter. Using the mPower strip is simple! Just plug the mPower into your wall 230V AC outlet. 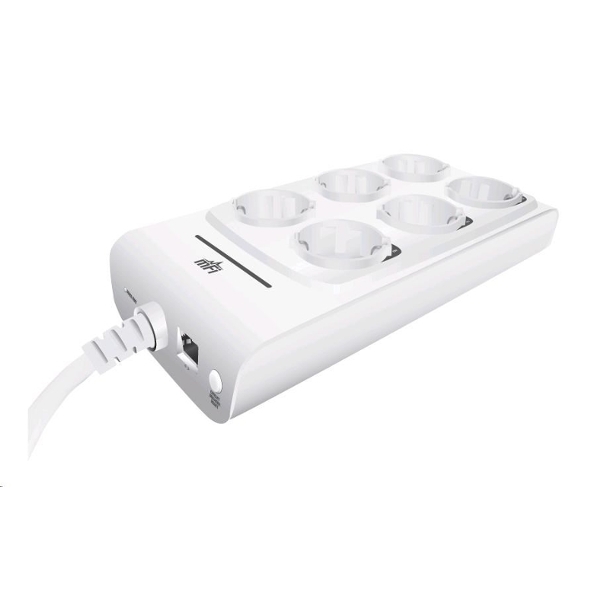 Connect up to 6 appliances to the 6 sockets on the mPower strip. You can connect extension cords as well. The mPower has a built-in Wi-Fi AP/Client to allow connection to the wireless network to gain the access for controlling of the AC sockets. There is no need for additional wiring. Simply let your mPower to connect to your existing AP (as a WIFI client). You can use the cloud service at mfi.ubnt.com to monitor and control each outlet separately and independently. The mPower allows measuring of the consumption of each socket. After setting up the mPower and adding your electricity billing rate, you can also see the energy costs on-line as well. The mPower outlets can be controlled locally via a PC with the installed mFi Controller application. The management can be also done using the mFi cloud service. Using the mFi controller or the mFi Cloud you may create simple or complex rules to active each socket at the right moment. mFi technology is designed to create and manage your smart home or workspace. The mFi allows you to monitor and control AC powered remote devices and to collect data from external sensors. The mPower is equipped with integrated Wi-Fi which supports standard 802.11 b/g/n . The mPower communicates directly over Wi-Fi. The connected appliances can be controlled using your computer via a web browser. Create your smart world using the mFi technology and the mPower AC strip!